There is, unfortunately, some truth in what you have heard. Haad Rin on Koh Phangan, where the Full Moon Party takes place turns from being a virtual ghost town into a place which is overflowing with mostly young, often drunk, foreign visitors for 3 days before the Full Moon Party and 3 days after. Every room, bungalow or dormitory in Haad Rin and nearby Baan Tai get booked out and the bars and restaurants are full. For many local businesses their entire month’s income comes in these few days. This has some negative consequences in respect of the way foreign tourists are sometimes treated. Firstly, some of the resorts no longer bother with the basics of customer service or spend much time maintaining their rooms. And why would they bother? When demand outstrips supply all you need to do is to provide something resembling a bed and people will book it. Staff and owners can be as rude as they like to their customers because they know that if guests are not satisfied then there are lots of other people who will want their room instead. Secondly, imagine you lived in a place which got invaded once a month by thousands of drunk young foreigners from other countries whose behaviour is sometimes not as good as it should be. 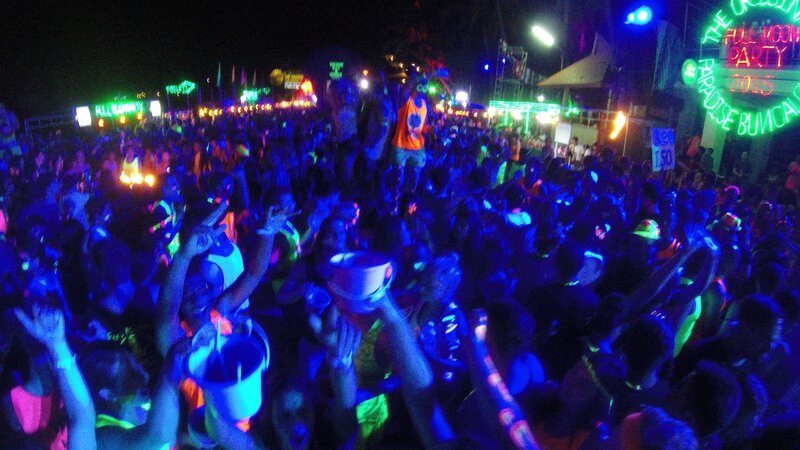 The Full Moon Party creates something of a strain on relations between locals and foreign visitors. People get stressed out and sometimes do not treat tourists quite as well as they might under different circumstances. For Luxury accommodation try The Coast which is a super stylish resort on the main road before you get into Koh Phangan. For a Mid-Range option on the Full Moon Party beach try Tommy Resort, I like the people there. For somewhere Budget try either Paradise Bungalows (the original Full Moon Party guesthouse) or Same Same Guesthouse which is known for its party atmosphere and very friendly service. For a full run down of the accommodation options and some honest reviews visit Haad Rin Hotel Reviews, which covers the main resorts in Haad Rin and links to guest reviews from TripAdvisor. Have a great party and please send us some pictures that we can publish on Thailand Life.